Datameteo WRF’s numerical weather forecasts cover 168-180 hours from the moment of initialization to the end, updated several times a day, depending on the area model domain. The WRF model solvers used are the new ASYNC Model derived by the ARW architecture) .This means that a forecast for a specific time step is calculated 12 times ranging from the first model run ( 168 hours in advance ) till the closer one ( 12 hours in advance ) which is stored in the archive. This enhances the value of the archived data by a factor 2,5 because there are much more “potential solutions” for that parameter at the selected time step. 4,5 Years of archived data, with 12 different deterministic solutions for each value, are in point of fact similar to more than 10 years of continues data series. Numerical models cover the entire world and enable the production of weather forecast for any place on Earth, irrespective of whether a meteorological recording station exists or not. 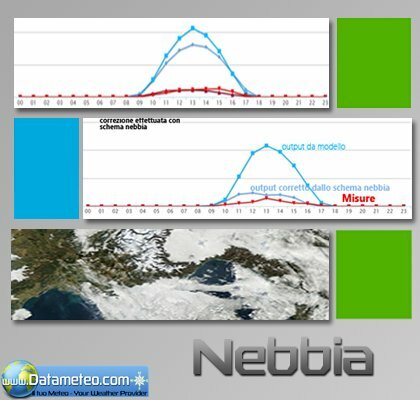 Through the high spatial resolution, which calculates forecast for every 1- 3- 10 km, we produce local forecasts which include the effects of local climate, topography and soil cover. 1. Distinction between valley, slope and summit temperatures in mountain areas. 2. Detection of weather barriers (e.g. Alps, Andes), with distinction of rain, wind, etc. Our detailed weather forecasts are calculated for 1-7 days ahead. Larger forecast periods are covered in less detail as special services. Our weather models are composed of evenly spaced grid cells, which cover large domains. . The atmosphere is divided into 55 or more layers, for each of which a forecast is calculated. 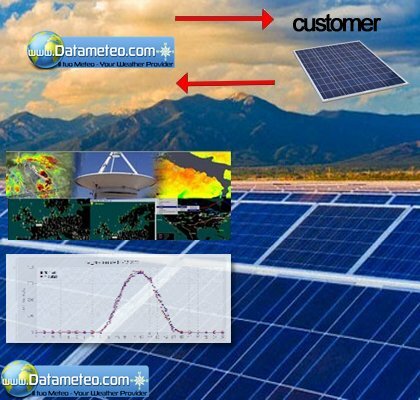 Our model calculates forecasts for each grid cell and layer at least once daily, starting from “initialization” time to the end of the “forecast period”,which is 3-5 days.Our high resolution forecast are “live corrected, when applicable, with validated satellite feed observations. A new multimodel platform is under developing to improve forecast accuracy taking account for different weather models and weather scenarios. In addition is also available the DWD Global Wave.The DWD World Wave model is a global model, generating wave information, including wind waves and swell with the forcing by analyzed and forecast 10m-winds of the atmospheric model ICON. 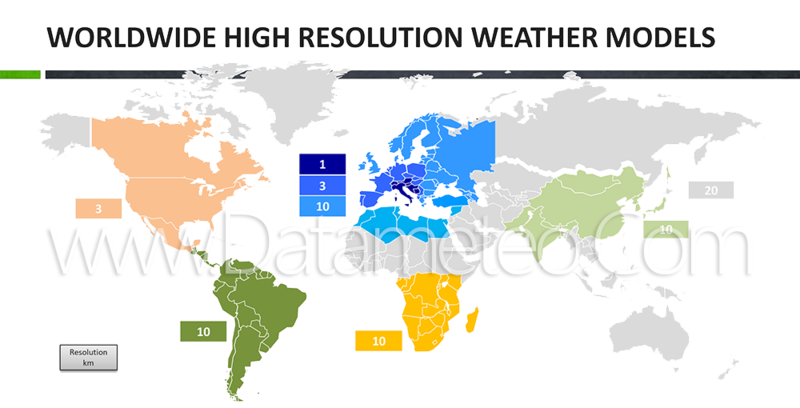 Datameteo still use global scale WWIII model. 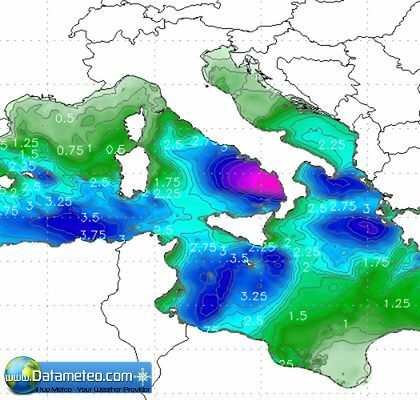 The global model is initialized daily and is forced with NOAA/NCEP's global forecast system (GFS) winds for the oceans area while for area along the coast and the Mediterrean the wind forcing is given by WRF high resolution weather model outputs. This model is designed to capture the large scale ocean waves, provide spectral boundary conditions for the Mediterrean sea regional WWIII model, and most importantly, a 180 hour (7.5 days) forecast.In order to capture the shallow water effects and the nearshore coastal dynamics such as refracting, shoaling, and smaller scale shadowing, a high resolution SWAN model is utilized to provide a 7.5 day forecast. The Simulating Waves Nearshore SWAN model has a resolution of 1, 5 Km while deeeper resolutions can be applied to provide more detailed forecast including the harbour profiiles..
A full hindcast and data assimilation system can ingest every type of local measured data like currents etc.. to keep the local forecast more reliable and accurate. Ensemble forecasting is a numerical prediction method that generates a representative sample of the possible future states of the weather. Multiple numerical predictions (model runs) are conducted using slightly different initial conditions that are all plausible given the past and current set of observations, or measurements.Ensemble forecasts are mainly applied to large-scale weather conditions for the forecast range of 3 to 14 days. Applications to local forecasting in high resolution are limited, due to the very high computing effort required. For a long trend prediction the CFSv2 climate model is used. The CFSv2 is run once daily at NCEP, at multiple time scales. The medium-range model forecasts in one-week intervals out to four weeks, while the longer-range scale forecasts on three-month moving averages out approximately nine months. The shorter scale has some overlap with the Global Forecast System. The "Coupled" in the model's name refers to the fact that the model couples both atmospheric modeling and oceanic modeling into one all-purpose model. Its forecasts are derived from a 16-member ensemble, with each member initialized on a lead of several days worth of conditions. The CFSv2 offers output that can be masked to remove forecasts with insufficient skill. Among the variables made available to the public include precipitation and surface temperature (both of which are available both on a global spatial scale and a continental one), winds at 200 and 850 hectopascals, and heights at 500 hectopascals (all of which are available only at the global or hemispheric scale). Output is rendered as deviation from normal. .